Poor, little Midnight. 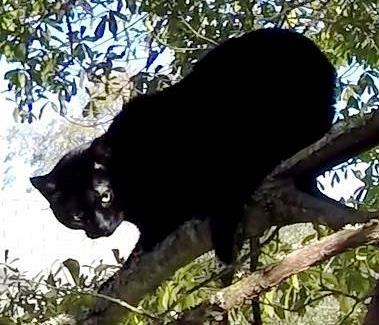 This black cat had been stuck in the tree next to his house for five nights, and most of those nights were below freezing. 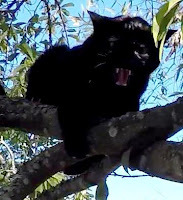 He was cold, weak, dehydrated and tired of being stuck in that tree, and I could hear it in his impatient, raspy voice. Prior to climbing the tree, I was told that Midnight was a very sweet cat who was very sociable with strangers. That is what I always love to hear, because it usually means that the cat will be cooperative and the rescue will go quickly. There are no guarantees about that, of course, and Midnight proved to be one of those exceptions. It did not take long to learn that Midnight was not going to be one of those cooperative cats. He began hissing and spitting at me before I could climb even 10 feet high. While I have experienced a few mildly hissing cats in my rescues before, I have never had a cat hiss and spit at me as much as Midnight did. He made it very clear early on that he did not approve of my encroachment, and he had no intention of cooperating with me in any way. If his language could be interpreted into English, I would not be able to repeat it here. In spite of Midnight's attitude, I still felt that, because of his normally social nature, there was a chance that I could befriend him. So I climbed up gently and slowly, avoided staring at him, gave him my sweetest voice, and paused along the way to give him time to adapt to me. Midnight was not impressed. When I opened a can of food, he took notice, but did not change his demeanor. I gave him some time to smell it and think about it while I slowly and gently advanced higher. By the time I reached him, I could hear how the tone of his voice was changing for the better. He was getting less stressed and more relaxed. I held the food out to him to sniff and consider, and he eventually relaxed and trusted me enough to eat while I held the food up to him. While I remained calm outwardly, inwardly I was feeling a great, excited moment of triumph. I still had my doubts about whether he would allow me to touch him, so I decided the best rescue option for him would be the carrier. I could place the food in the carrier, and he could walk inside while feeling like he had a safe distance from me. I have used this carrier method many times before, and it has usually worked very well. I remember only two cats in my rescue history who were so afraid of the carrier that they refused to have anything to do with it. In both cases, the carrier did not work, but I was still able to lure them back to me to rescue in other ways. In Midnight's case, however, the carrier turned out to be a huge mistake. He was terribly frightened by it, and now his trust in me had been irrevocably destroyed. Now, I was the enemy and could never be trusted again. Midnight turned away from the carrier and walked farther out on the downward sloping branch. In a matter of a few minutes, I had demonstrated how to earn the trust of a frightened cat and then lose it again. Midnight tried to find a comfortable position on the small limbs at the end of the branch, but some of them were too small and broke under his feet. I thought he would fall, but he managed to hang on. He was suspended only seven feet above the roof of his house, so it would have been an easy jump or fall for him, but he continued to cling to the small limbs. I tried to lure him back toward me by putting his food in a long-handle holder which I held out to him. But Midnight was either not interested or unable to negotiate the small limbs sloping upward in my direction. His owner, Erin, offered to go up on the roof of the house to see if she could reach him. She climbed a ladder to the gently sloping roof and stood beneath Midnight, but found him just out of reach. To my surprise, Midnight was stressed and afraid of her when she initially approached him. I watched while she spent several minutes talking to him calmly and giving him time to feel safe. When he calmed down, Erin pulled the limbs downward and finally managed to get Midnight just within her grasp. She pulled him down into her arms, and he happily settled in there. They sat on the roof of the house for a few quiet minutes enjoying the relief that each felt. I came back down happy that Midnight was safely down, but also somewhat disappointed that I was not bringing him down myself. 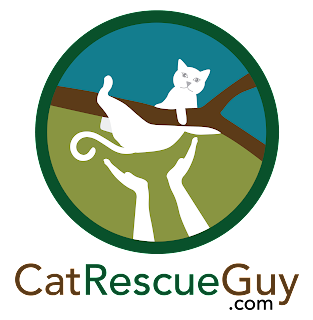 I love rescuing cats, and it is a great feeling to bring the cat safely down and hand it over to its loving family. But every rescue is different, and it is wise to be flexible. I was lucky and relieved that Erin was willing to get on the roof to grab her cat. 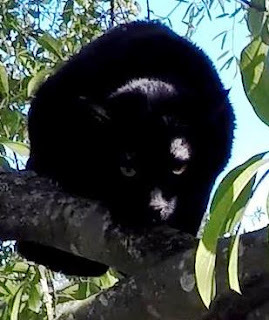 Otherwise, Midnight would have suffered through a more stressful rescue either by falling or by being snared in a most undignified manner by the rescue pole. So three cheers for Erin! She had the idea and the guts to do it. Well done.